A hearty autumnal treat and ready in 30 minutes. Heat the oil in a non-stick sauté pan and brown the chicken fillets on all sides. Drain on kitchen paper. Add the onion, garlic and paprika to the pan and cook for 3 minutes until softened. Stir in the tomato paste and stock, then return the chicken pieces to the pan and season. Bring to the boil, cover and simmer gently for 15 minutes until the chicken is tender and cooked through. Add the mushrooms to the pan and simmer for a further 5 minutes. Stir in the soured cream and sprinkle with the chopped parsley. 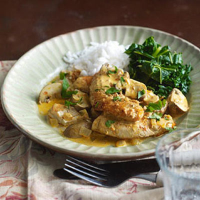 Serve with steamed rice and curly kale. This recipe can also be done with pork fillet. If you want to freeze it don’t add the soured cream. Cool and freeze then when you want to use it, thaw and reheat then stir in the soured cream as above. make this ideal with a full flavoured white such as La Baume, La Grande Olivette, Chardonnay/ Viognier 2009 IGP Pays d’Oc, South of France.